Mother’s Day is Sunday, May 14th, and we have gifts for mom’s, mom’s to be, grandmas, and special people in your life who were “just like a mom” to you! We can create a personalized, custom designed gift to match any Mom-A-Nality! Just give us a call today and tell us about her hobbies, interests, personality, and favorite goodies! You might tell us she: is a health nut, loves cats, enjoys picnics or the beach, is diabetic, a workaholic, loves to travel, likes savory snacks, craves chocolate, enjoys gardening, etc. 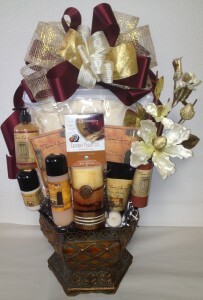 The Spa baskets are very popular! The Honey Bear basket includes a plush teddy bear, Camille Beckman Spa products in Tuscan Honey, tea, cookies, chocolates, and a candle. Spa products include: luxurious body lotion, bath gel, talc powder, Tuscan Honey soap, hand cream and scented drawer sachets, and more, all presented in ivory, gold and burgundy. 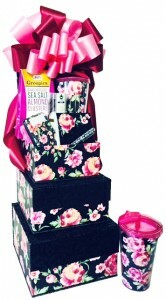 The deluxe spa baskets are presented in elegant metal containers and include a plush robe and spa accessories. come in beautiful wood trays, metal containers, festive gift boxes or baskets, and can include a tea pot or cup. Our Vintage Rose Boxes are elegant fabric boxes with magnetic closures. 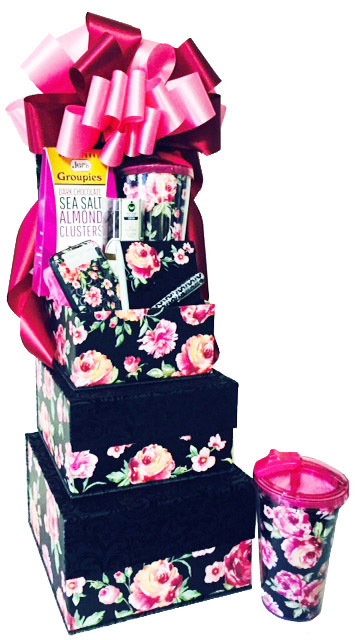 They are filled with matching travel mug, credit card holder, note pad and pen along with an assortment of fine chocolates, nuts, snacks, cheese, crackers, award winning cookies, dried fruits and gourmet items. Check out our Mother’s Day page for a large variety of options. Feel free to give us a call today to arrange a custom designed gift.